The New Flesh Workshop exists to bridge the gaps between Art, Medicine, Life and Technology. By providing a comprehensive approach to biotechnological design, we create solutions for unlocking the utmost potential of the human form, inside and out. New Flesh Co. is a biotech design consultancy, collaborative fabrication space and education center located in Lakewood CO. We provide a workspace for artist and technical fabricators as well as classes on art, electronics, sculpture, mold making and animatronics. We also provide design and prototyping services for companies and individuals. We partner with other art and fabrication organizations, companies, non-profits and individual artists on collaborative art, design and research projects as well as enrichment education programs. Our design core competencies include prosthetic and orthotic device customization, wearable technologies, armor system design and manufacture, composite material fabrication, biomedical device design, specialty silicone molding and casting as well as general mold/tool engineering and patent drawing services. I began studying technology, sculpting and fabrication since an early age. I attended school for biomedical engineering where I studied implant, surgical, diagnostic, sensing and prosthetic technologies. I have worked as a technical fabricator with New Flesh since 2007, developing biomedical devices, composite materials, wearable technologies and various contracted prototypes. I also hold a patent for an implantable artificial muscle system. 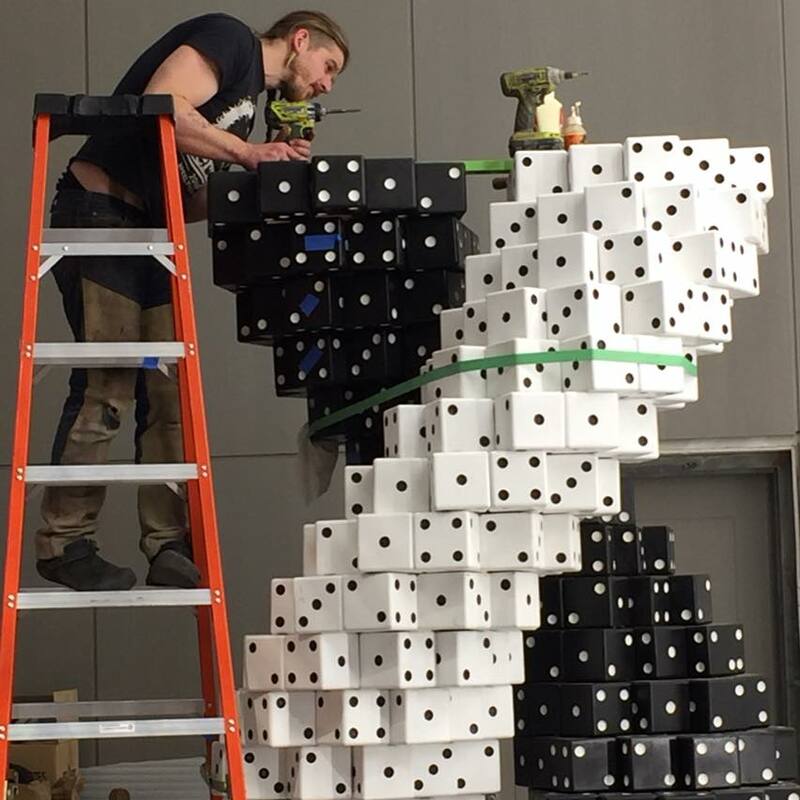 I have worked on many collaborative fabrication projects such as installations, large scale sculptures, Mutant Vehicles, wearable sculptures, high-end furniture, theatrical props, sets and costumes. I am well versed in mold making, composite material fabrication, 3D design and manufacture (printing, milling etc), sensor system and actuator hardware, prosthetic fabrication, medical device fabrication, fine metal finishing, woodworking, plastic molding/fabrication, welding and other methods. I have worked fixing medical devices, went to school for biomedical engineering where I studied implant, surgical, diagnostic, sensing and prosthetic technologies. I hold a patent for an implantable artificial muscle system. I have over a decade of experience as an after-school enrichment instructor, private tutor, summer camp lead/counselor, adult educator, lecturer and panelist. After completing a replica prosthesis for the Mutter Museum in Philadelphia received the Woods Institute Grant from the College of Physicians (which houses the Mutter) in 2014 to study extremes in human cognition and physiology. I have managed dozens of art project builds, installations, prototyping projects, R&D projects, and performances and have worked as an administrator on a disaster relief mission to Japan as well as local relief efforts in various communities. Raised in the tundra and taiga of North Pole, Alaska, Paul Tupek exhibited signs of being a crafts-person early on. As a child he enjoyed smithing nails into small swords for his G.I. Joes and creating various lures for fly fishing. While honing his sub-Arctic survival skills and enduring earthquakes, moose, even a tsunami (once) he also found time to study knife making and anthropology at the University of Alaska Fairbanks. After traveling around the lower 48 working as a fishmonger and butcher he decided to visit his brother in NYC who convinced him to stay. Since planting feet here in 2006 he has worked on various blue ribbon-winning Maker Faire projects, was on a team that won best Industrial Design at the Idiotarod, and studied leather-working at FIT (his wares can be found at Gothic Renaissance and custom pieces can be commissioned). He currently lives in Brooklyn with his girlfriend and two alien cats, works as stage technician, and continually works on costumes and various art projects in his spare time. He joined the New Flesh Workshop in 2013 as a fabricator and soon worked his way up to becoming a designer and guinea pig. Many years and many mini sledge hammer hits later, a solid bond was formed. His favorite aspect of the New Flesh Workshop is the shared goal of creating wearable technology available to everyday people, and in turn creating superheroes. Randy's tenure at the New Flesh Workshop began when Doc Adventure saved his life from a man-sized tarantula back in 2010. Before then, he worked on projects in biomemetic carbon sequestration, IED blast protection, and on forming a functional adult human being. After spending 3 years with Doc training in prognostics, personal development, and high powered fully functional personnel protective suits, Randy burnt everything he owned. He then rode a motorcycle around the country for a year. Clearly, Doc Adventure is a good influence. You can now find Randy in Oakland, California, where he's established a shop of his own. Within, he creates post-apocalyptic future tribalistic sculptures, large-scale installations, custom sensor solutions, art cars, LED fixtures, and just about anything else one can dream up. In his spare time, he is employed by UC Berkeley to run the Digital Fabrication Lab, where he manages and maintains a bevvy of laser cutters, 3D printers, and other CNC equipment. Originating in the Bay Area, Rez currently resides in Denver, Colorado. They produce acrylic paintings, pen & ink line drawing, digital design, bodypaint, jewelry / headdress construction, sculpture, mural and installation work. Rez has studied art in both classroom and one-on-one environments, and had their first gallery showing in 2013 at Berkeley City College. Inspiration for their work comes from musing upon the human condition, the rapid development of technology, gothic and brutalist architectural works, the intersection of reason and emotion, and investigations of inner worlds. Multidisciplinary artist, craftsman and general producer. He has always pushed his abilities and self expression. His early years as a painter and sculptor has left a lengthy show resume and works of art in private collections internationally. However, his dedication to skilled craft and production has led to some amazing places. As one of the lead fabricators for Overkill Movement he helped conceptualize and produce big art and shows for many years under master builder Yarrow Mazzetti. On his own Ben has the luxury of traveling around and selectively choosing clients to work on projects big and small. Known for a naturally wild creativity, pragmatism and honed execution style he is clearly making things happen wherever he is at.